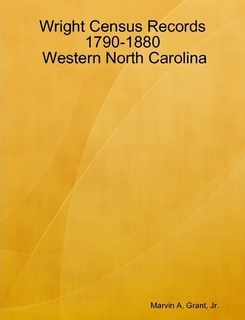 There were many Wright families in Western North Carolina in the late 1700's through late 1800's. I have transcribed all the Wright, Right (and other spellings) listed on the Federal Census Records for the years 1790, 1800, 1810, 1820, 1830, 1840, 1850, 1860, 1870 and 1880. I have only included western North Carolina counties, not the eastern or central portions of the state. The early census records only list the name of the head of household, but the 1850 census was the first to list every member of the household by name (except slaves.) I have also included the Slave Schedules and Mortality Schedules. Edition: First (5 Aug 2010).